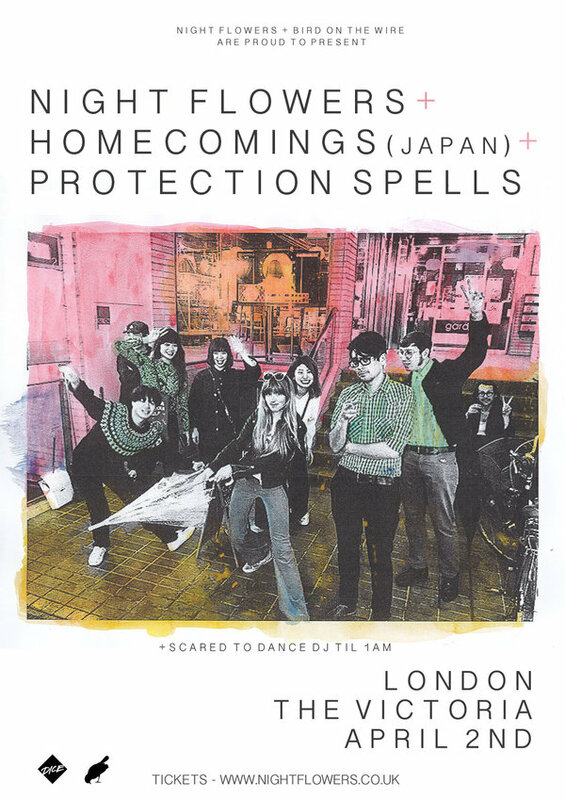 Night Flowers and BOTW are proud to present..
After touring mainland Japan together in 2018, we are very happy to invite our friends, the brilliant HOMECOMINGS to play their very first tour of the UK. As this is the very first HOMECOMINGS show in London, and our very first of 2019, what better way to celebrate than to have our very own homecoming, at our old stomping ground, the illustrious VICTORIA in Dalston. This will be a limited capacity show, so don’t sit on getting your tickets! Emerging in Japan in 2012, Kyoto based indie pop quartet Homecomings are one of the most talked about bands on the current Japanese indie music scene, combining fuzzy & jangly guitars, catchy, bittersweet dreampop melodies and beautiful vocal harmonies. In 2014 they released their debut full length “Somehow, Somewhere”, swiftly followed by their sophomore album “Sale Of Broken Dreams”, which were both enthusiastically received in their homeland by press and fans alike. Homecomings have played many memorable shows as support to the likes of The Pains of Being Pure at Heart, Mac DeMarco, Julien Baker, Norman Blake（Teenage Fanclub) and Cloud Nothings. Last year they released their excellent third full length “Whale Living” to great acclaim. It has been a whirlwind few years for London indie-pop quintet Night Flowers, ​since these close friends from North England collided with Boston, Massachusetts born vocalist Sophia Pettit and perfected their irresistible brand of heart stirring, romantic pop. A joyous combination of intertwining female/male vocals backed by huge, glistening guitars and dreamlike atmospherics has seen them amass friends, fans and accolades across the world. With the release in 2018 of their long awaited debut album 'Wild Notion​'​ the band hit the road in full effect, blowing blissful gales through audiences the world over at packed out club shows and festivals in Europe, Japan and the UK, with The Pains of Being Pure At Heart​ and Japanese Breakfast, amongst many others.